As I wrote before in Mundane but Beautiful, one of our goals of traveling in 2013 is to look at the world with wonderment. This is a continuation of the idea. Places have their own flavor and atmosphere yet so often the things that lend that atmosphere are subtle. Here is a look at some interesting signs and wall art that I have seen over the years. Each one shows a side of the place without being one of the big sights. Ios is an island of the Cyclades chain in Greece. I was there at the end of the party season, so it was pretty quiet, but signs like this show the kind of atmosphere around. 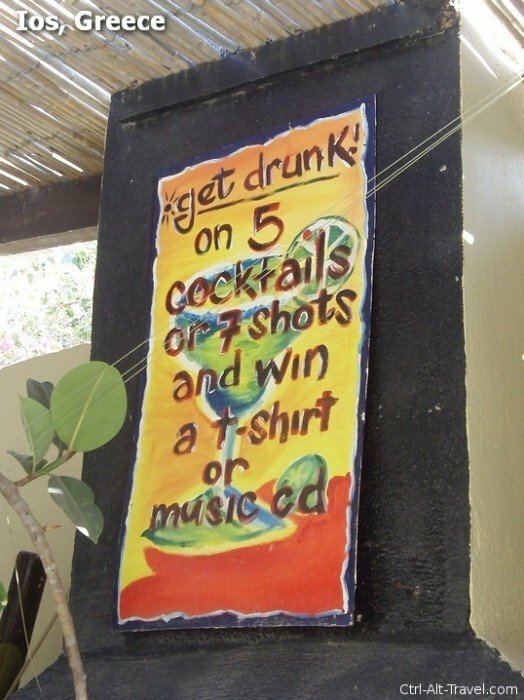 I am sure people are looking to get drunk anyway, but really is a t-shirt or a CD really a good incentive? Also note that it is in English, on a Greek island, which tells you a little about their audience. 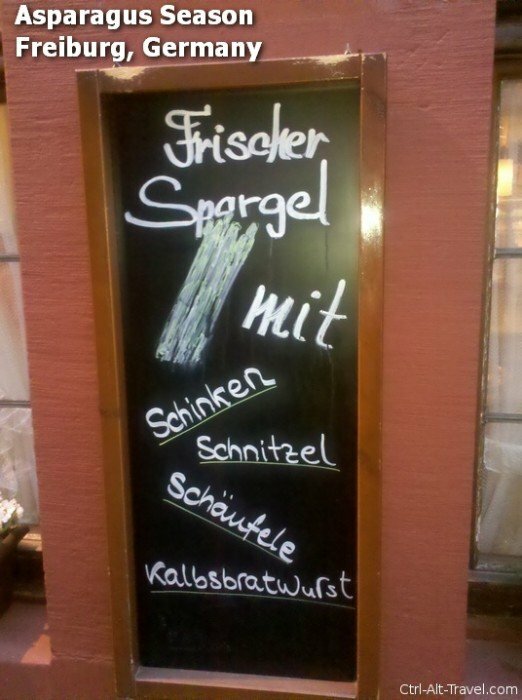 Germans love asparagus. When the season hits “Spargel” is everywhere. Stands by the road, in the market and definitely at the restaurants like this one in Freiburg. The other words are the various sides you can get with it: Ham (Schinken), Schnitzel, Schaufele is pork dish or veal sausage(Kalbsbratwurst). Enjoy your fresh asparagus with greasy meat. Yup that sounds German. Oh and the asparagus is actually white here, not that they didn’t have any green chalk. A number of years ago, I took a bustrip into Scotland at Christmastime. 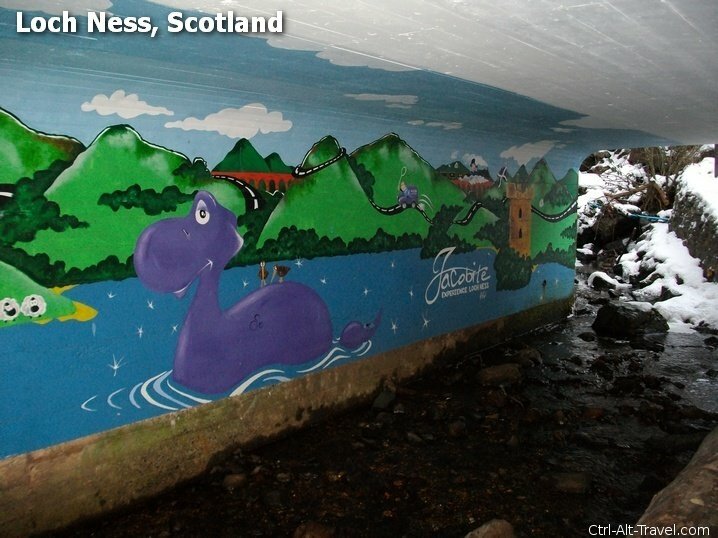 You can’t go through the highlands and miss out on Loch Ness. It was a cold and blustery day, but I braved the cold to go down to the lake. This was in the tunnel under the road. The happy monster and green hills are pretty, but I didn’t see either of them. I am a fan of Harry Potter. I like most fantasy books actually. Prague itself is a bit like a fantasy book with the spiky towers and glowering churches. 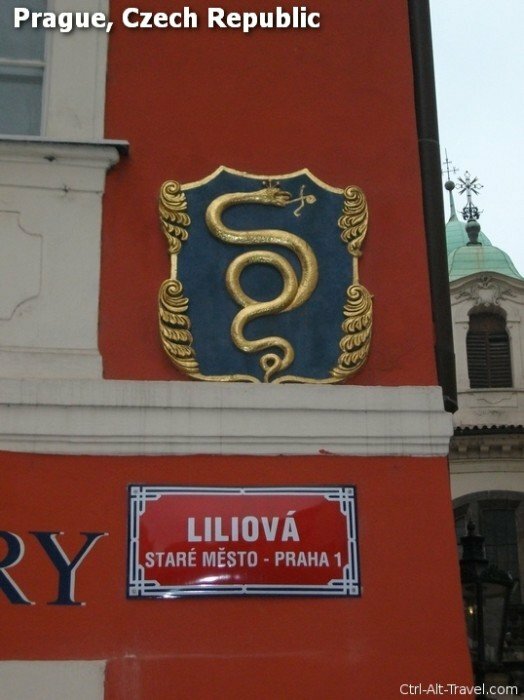 So it isn’t so surprising that my mind went to Slytherin house from Harry Potter when I saw this sign on the trip where Ali and I met in Prague. Basel is just an hour on the train south of Freiburg, so it is a reasonable daytrip from there. We went down to just walk around and see the place. Off of the main marketsquare is the red painted town hall of Basel. 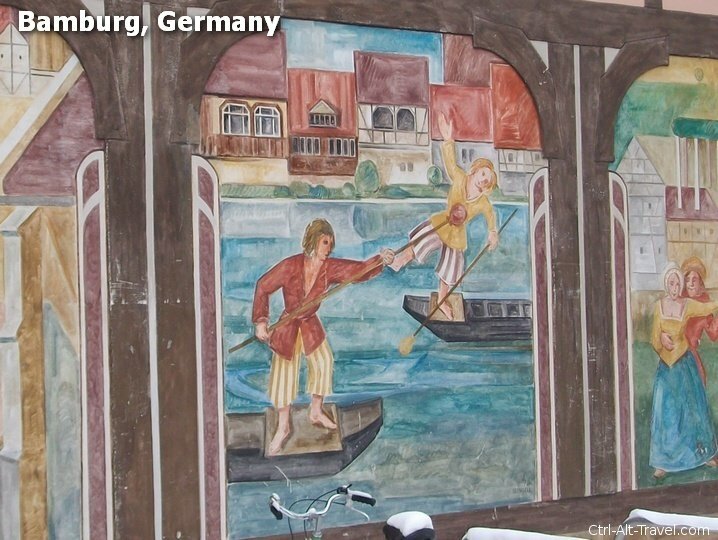 This painting is on the wall in the courtyard. 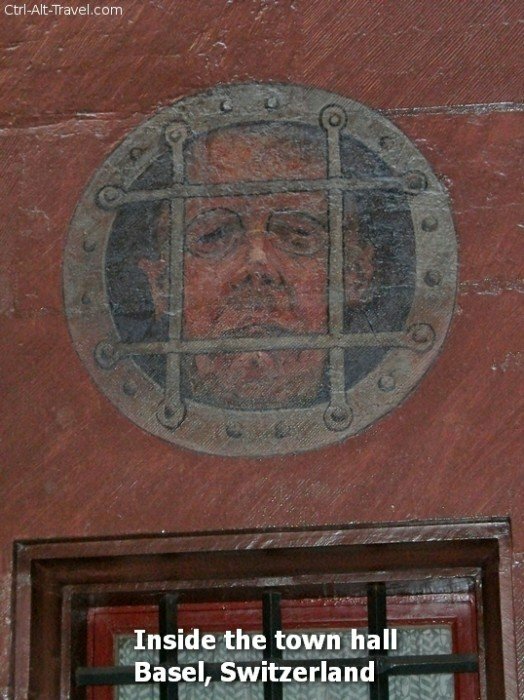 I wonder who this bespectacled trapped man is and why is his visage on the wall. I noticed this darwing drawn on a pillar near Pike’s Market in Seattle. Beyond the creativity of it to direct people down to the store, I liked the fish. It has a Pacific Northwest Native feel to it. Reminiscent of totem poles and native art. It just fits in Seattle. Ali’s first summer in Germany we took a long weekend to go see Liechtenstein. We ended up staying in the town of Triesenberg which is halfway up the mountain from the capital at Vaduz. 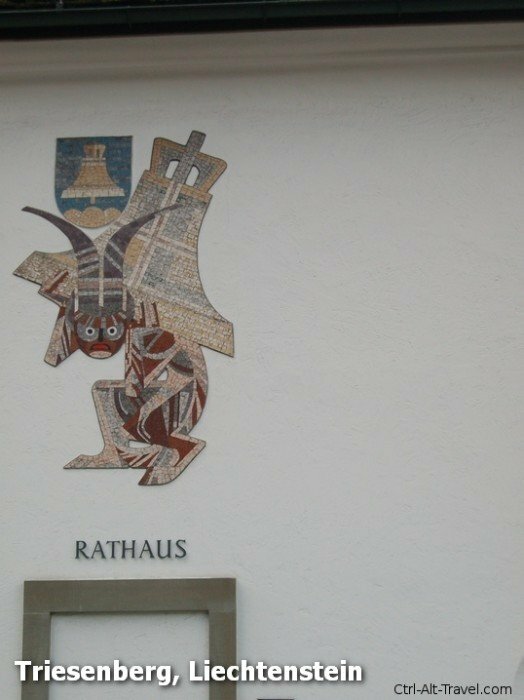 Treisenberg is tiny, but had a townhall (Rathaus) with this guy on it. There was a story about him, his horns and the bell, but I just don’t remember it anymore. Something about the people who originally settled there. Even still, it was cool to see and is very symbolic of the place. 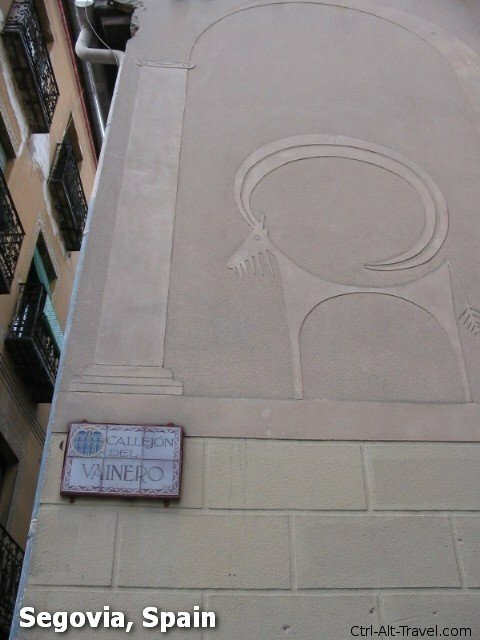 This shot is from a trip to Spain in 2003. I took a daytrip from Madrid up to Segovia, which is a pretty awesome place. Noticed this guy on the wall. Absolutely no clue why he is there or the story, but it was cool to see. Wall art ranges from functional to subtle to blazon, and yet it always shows an aspect of people. It shows what they find important and echoes things from the culture. 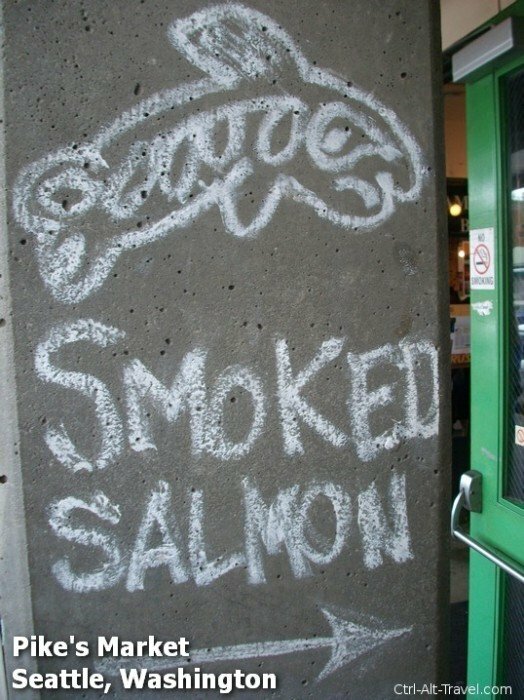 The fish drawn in Seattle shows the native influence. The party sign shows what kind of crowd they expect there. And yet the meaning isn’t always clear. I have no idea who the guy behind the bars is in Basel, but it was important enough to paint inside the city hall. 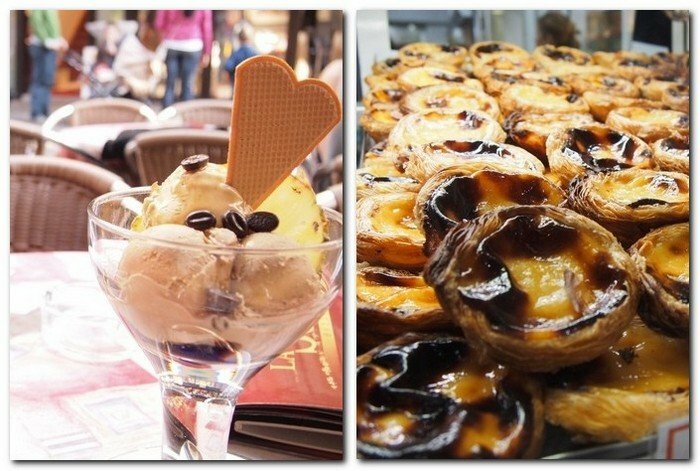 Do you look at details like this when you travel?